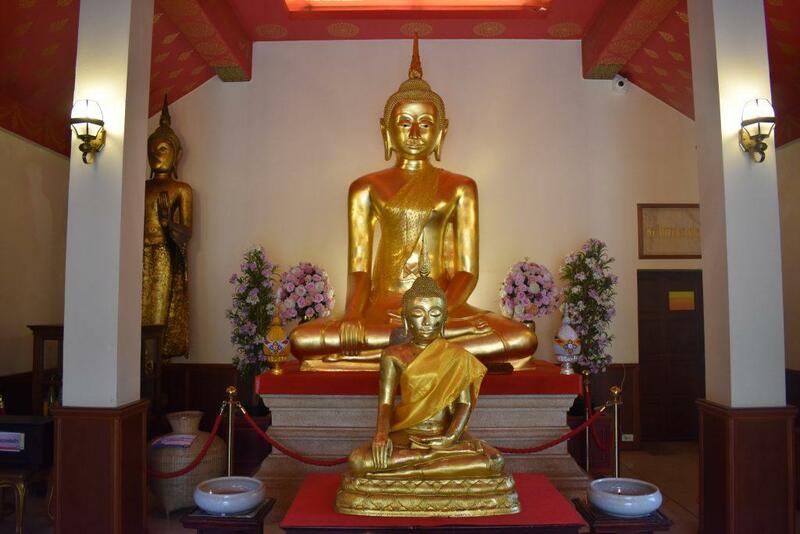 Wat Saket in Bangkok is a historic temple dating from the Ayutthaya period and built in 1467. 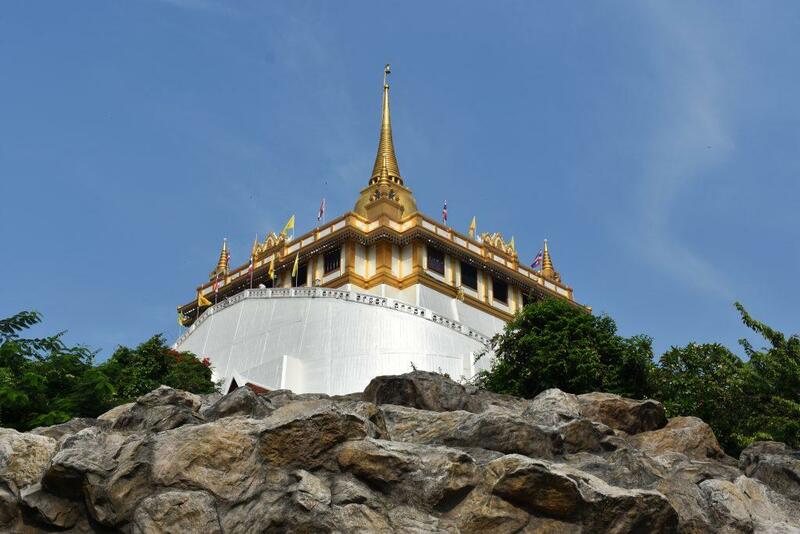 The temple is also known as the Temple of the Golden Mount or the Golden Mountain Temple. 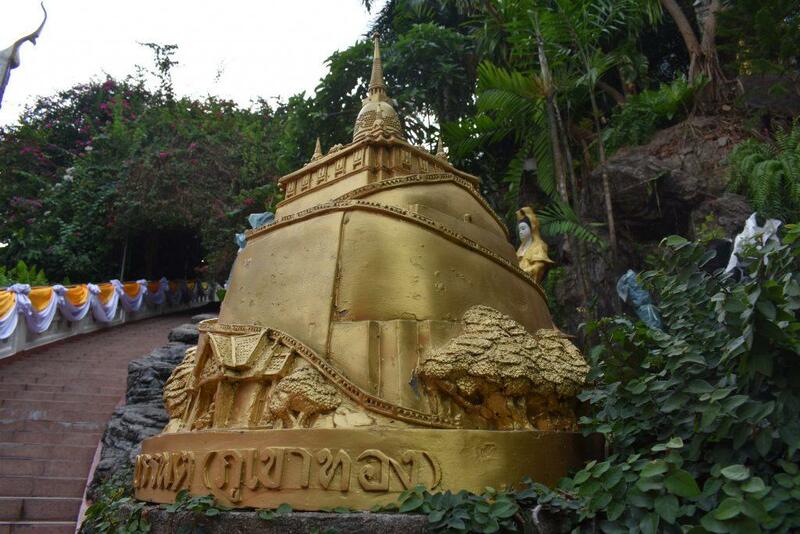 The Golden Mount (Phu Khao Thong), added to the temple during the reign of King Rama V is an artificial hill with a golden chedi on top. 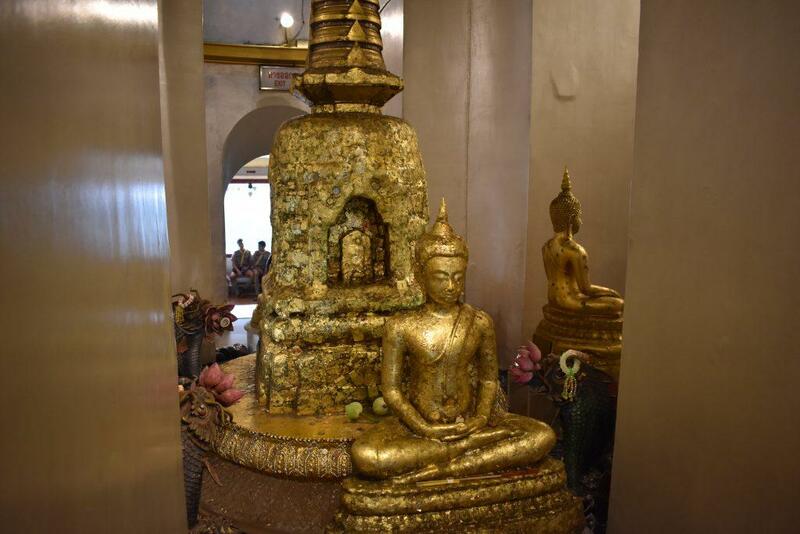 The Buddha’s relics are buried under the chedi. 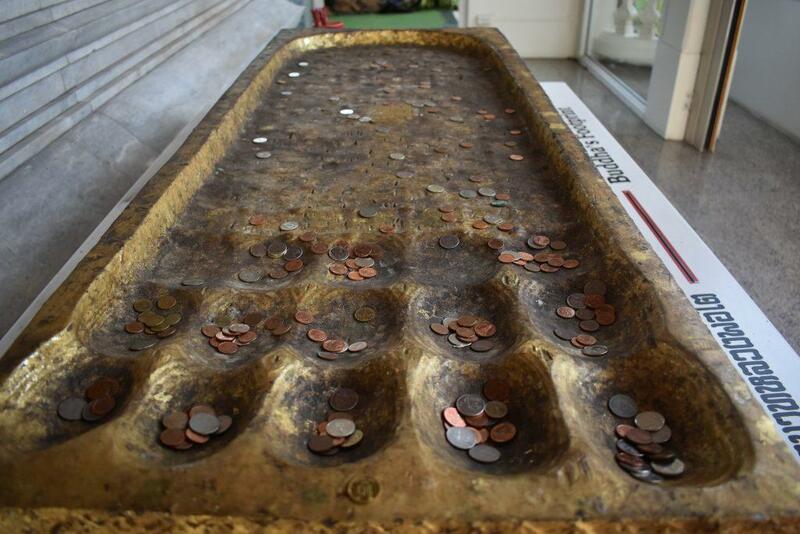 The relics (his teeth) were a gift from the British government to King Rama V after their discovery in India. 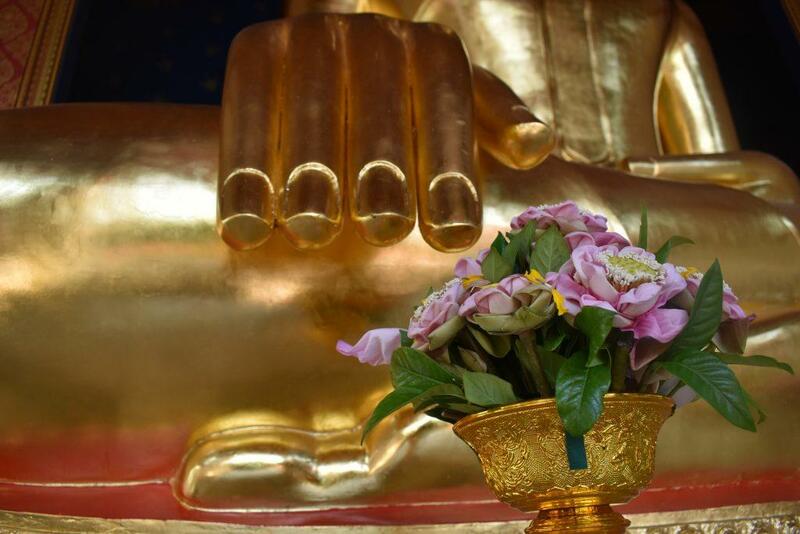 Wat Saket also holds the title of the highest temple in Bangkok. 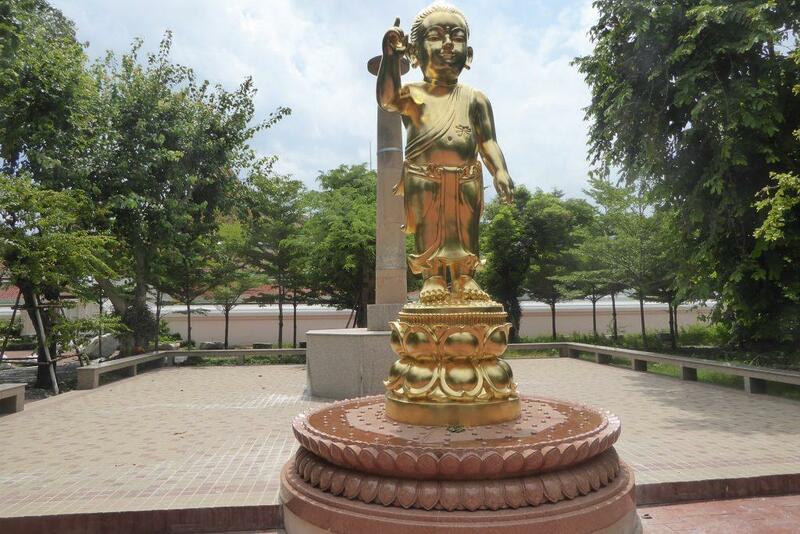 Wat Saket isn’t just the Golden Mountain. 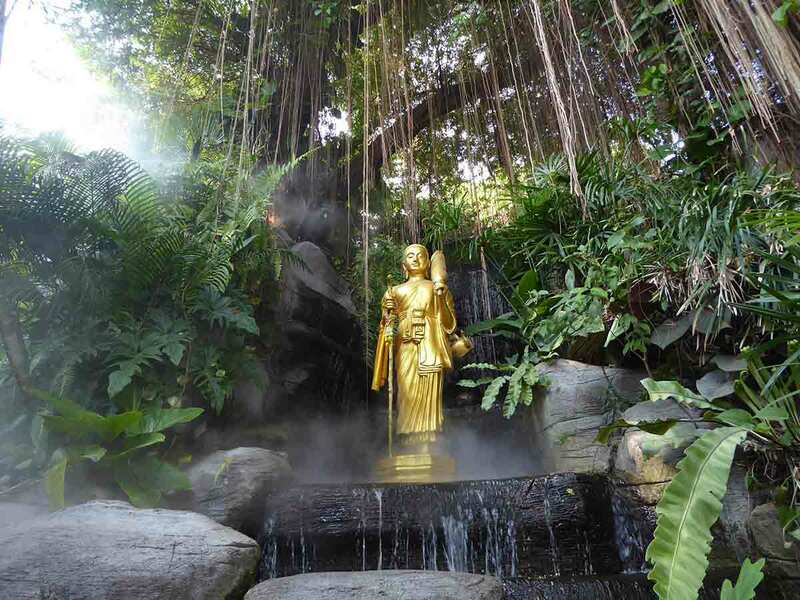 Take time to explore the temple complex below which has some fantastic Buddha images. There is a long winding staircase with 344 steps leading to the top where you get a 360-degree panoramic view of the old city and beyond. 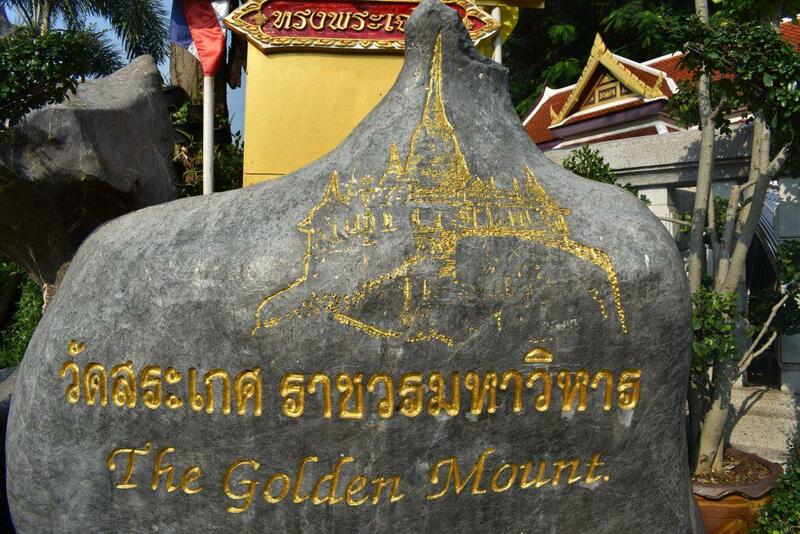 The Golden Mount was once the tallest structure in Bangkok before the age of the skyscraper and is still one of the city’s most famous landmarks. The ticket office is next to the main entrance. Tickets are 50 baht. Either side of the ticket office is a Kinnari, half human half bird statue. There are 344 steps to the summit which start just next to the ticket office. 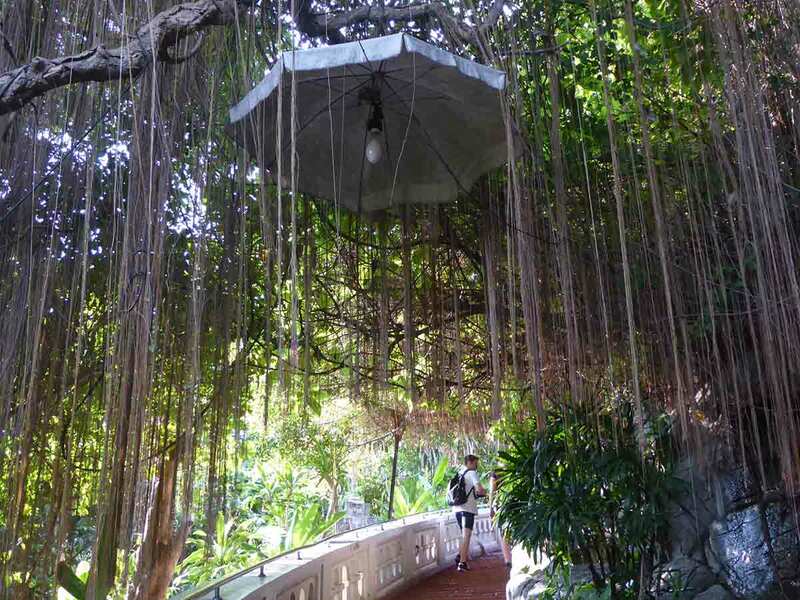 The path runs through a hanging garden covered by vines and shady trees with a waterfall, along with Buddha images, flower gardens, and sculptures of vultures, monkeys, turtles, and a mini Golden Mount. 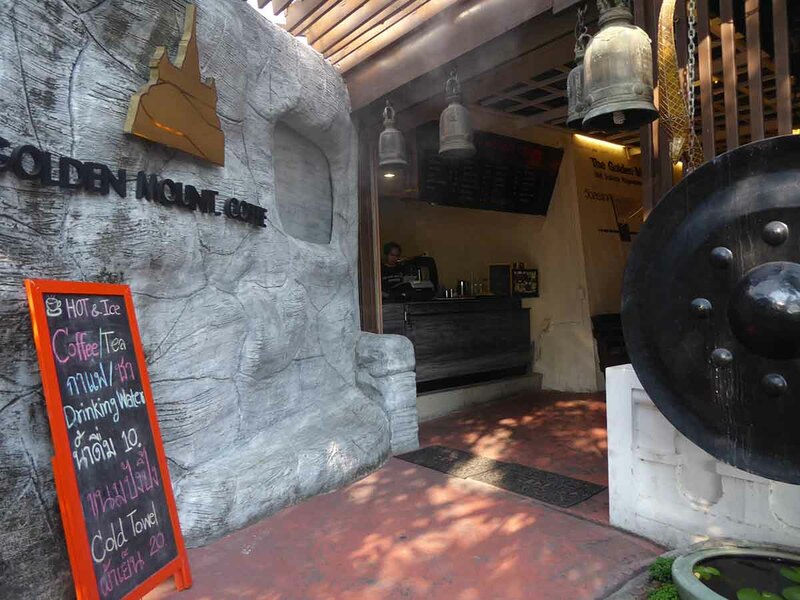 At the top of the first set of steps is Golden Mount Coffee, a small shady cafe with free WiFi. 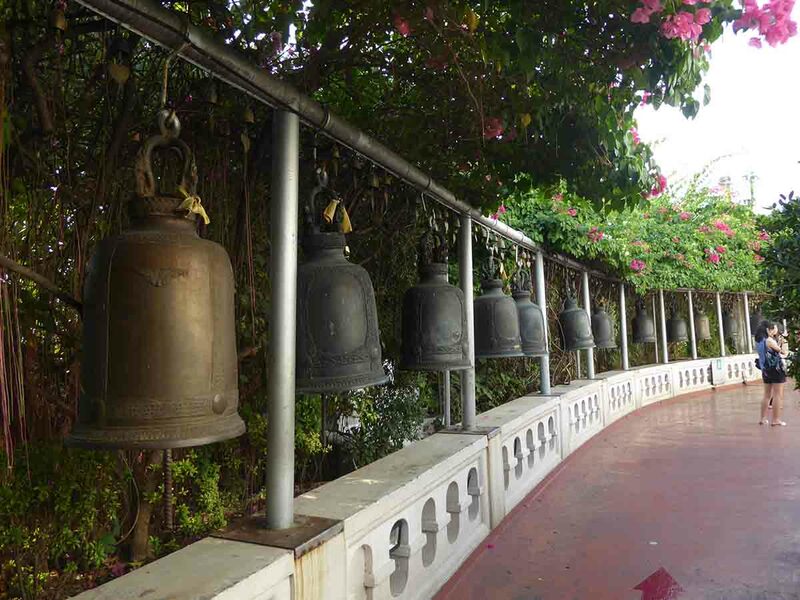 Just past the cafe, you will come to a flat area of prayer bells, a giant gong, a small Buddha shrine and some benches where you can rest. 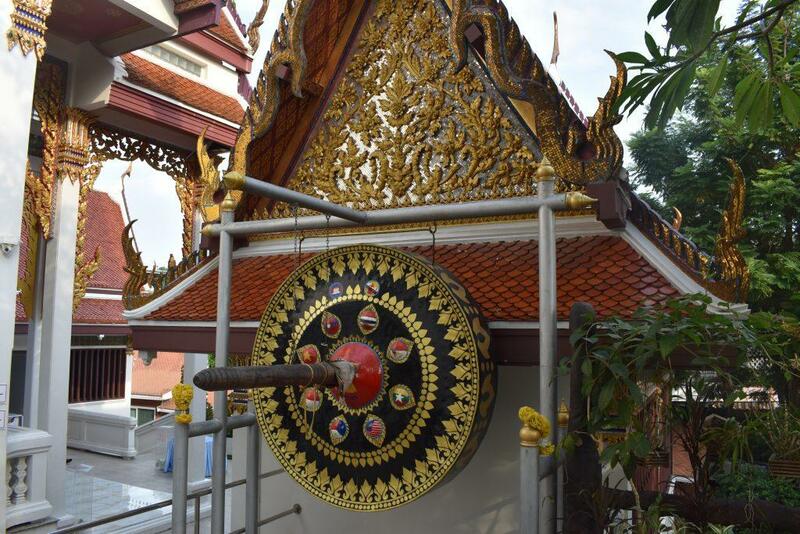 You ring the bells for good luck, make a wish, then bang the gong. Continuing upwards you will pass more bells and the staircase becomes wider, less steep and easier to climb. Reaching the top, you will enter an enclosed shrine area surrounded by windows. Continuing upwards you will pass more bells and the staircase becomes wider, less steep and easier to climb. Reaching the top, you will enter an enclosed shrine area surrounded by windows. You don’t need to remove your shoes here. You remove your shoes when you enter the rooftop area. 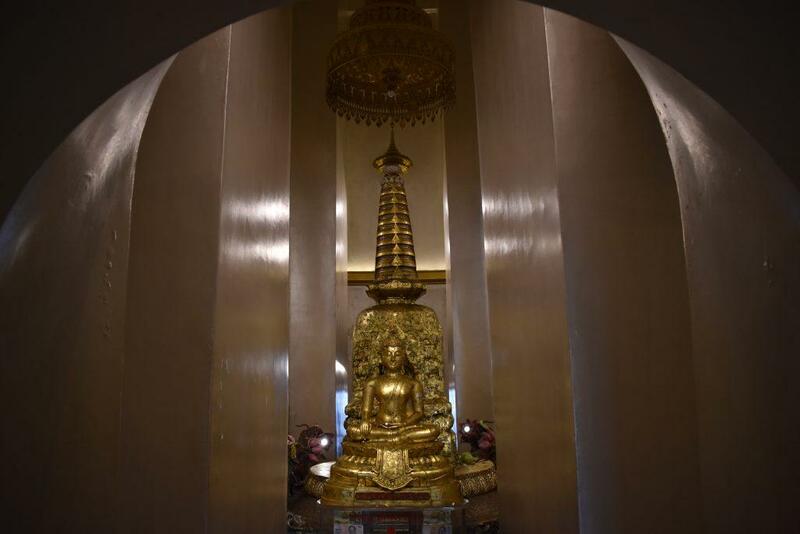 Inside you will find a small shrine directly underneath the rooftop chedi which contains Buddha relics. 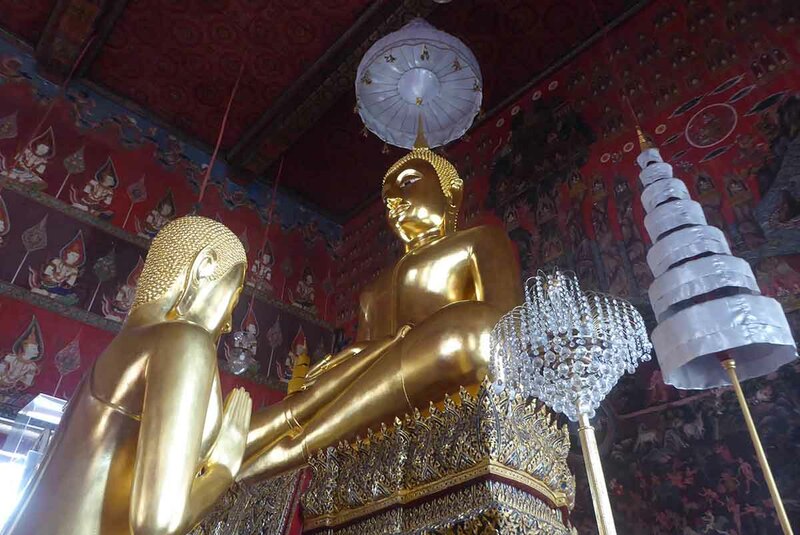 The shrine is covered in gold leaf applied by worshipers over the years. Elsewhere in the room, you will find more shrines where people come to pray, make merit & seek blessings. 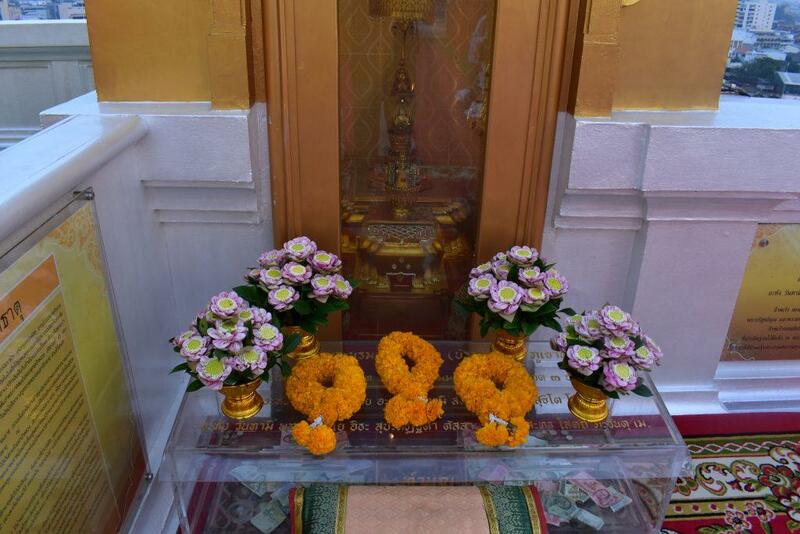 To worship at the Golden Mount, you need 9 incense sticks, 1 candle, and 3 lotus flowers. 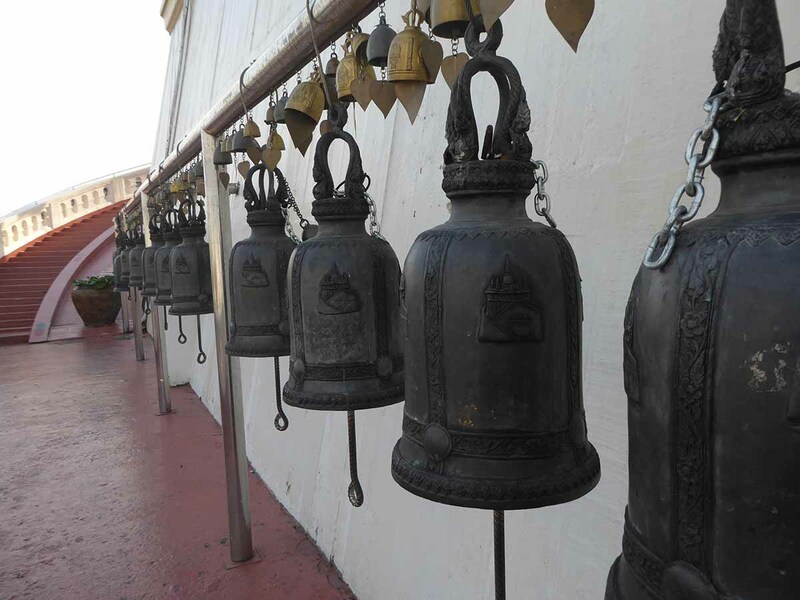 Worshippers believe that after worshipping you will be healthy as the name Saket means to clean off the dirt and you will have a stable life as the Golden Mount is on a solid mountain. 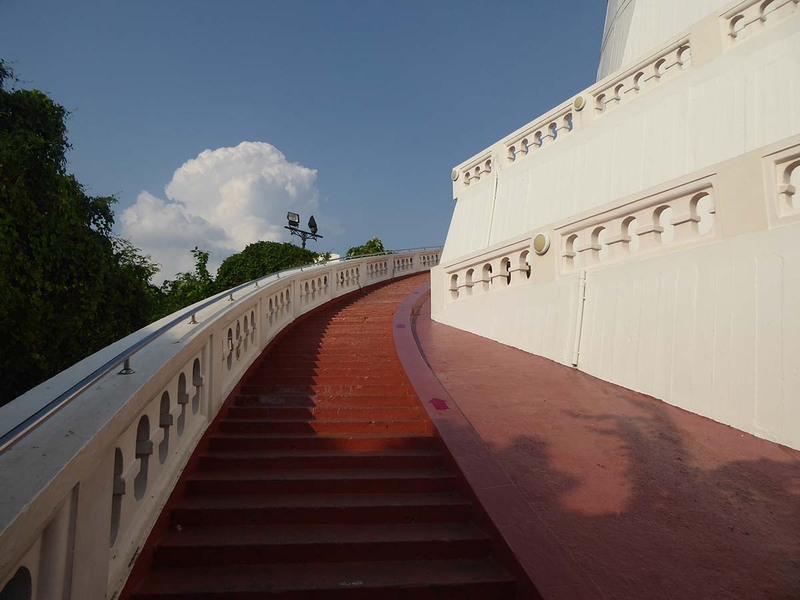 To reach the chedi terrace on the roof you need to climb a narrow set of stairs located near the entrance to the room. 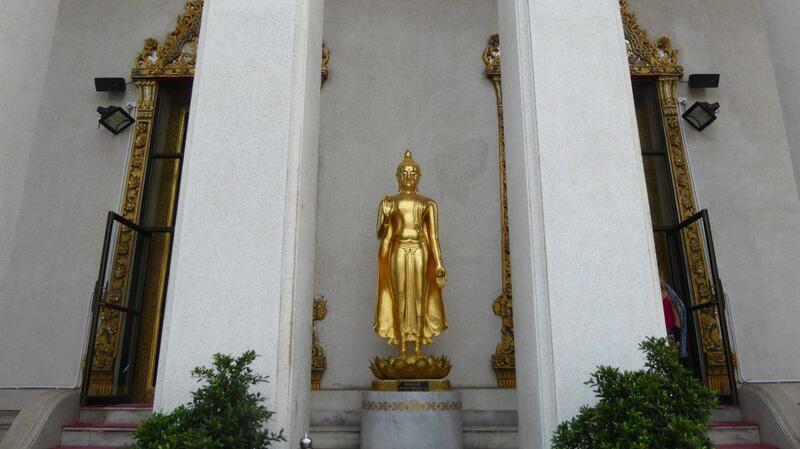 The chedi is made of gold mosaic tiles. 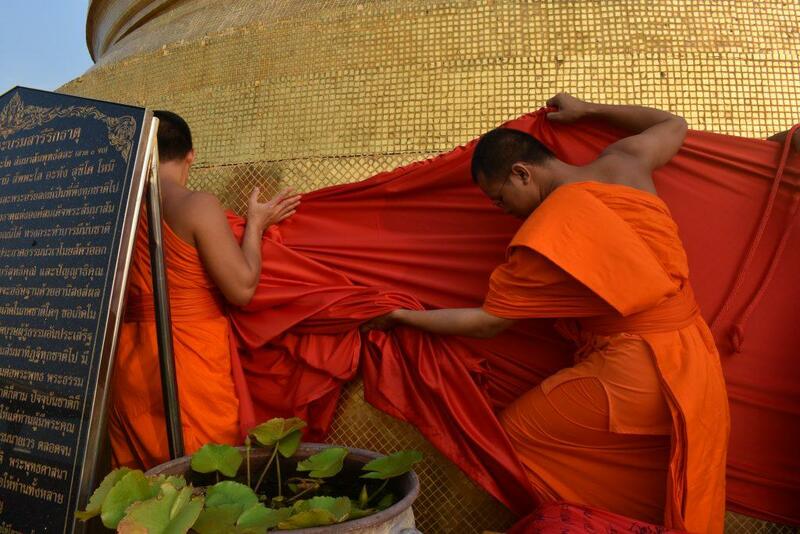 On important religious festivals, it is wrapped in red or gold cloth. The breezy rooftop is a peaceful place to relax for a while. There’s seating and the spot is not usually busy. The rooftop also provides amazing views of the surrounding area and beyond to the city center in the distance. 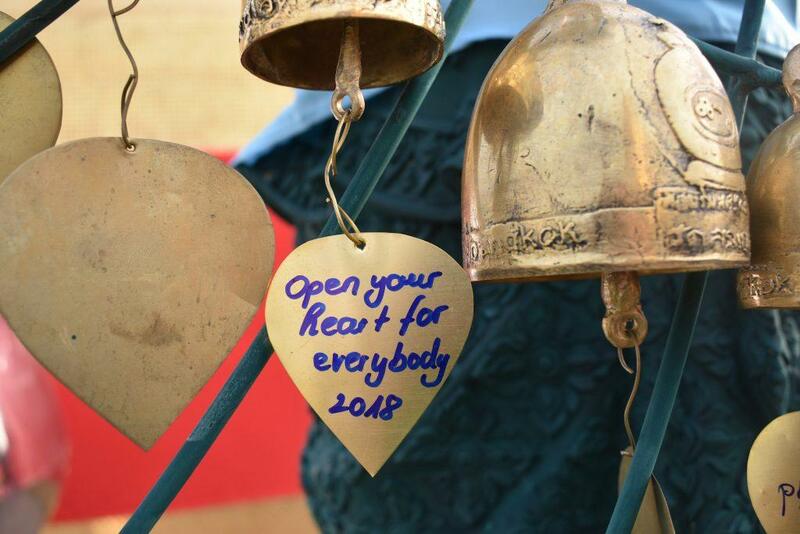 There are messages & wishes written on heart-shaped gold leaves hanging from bells. 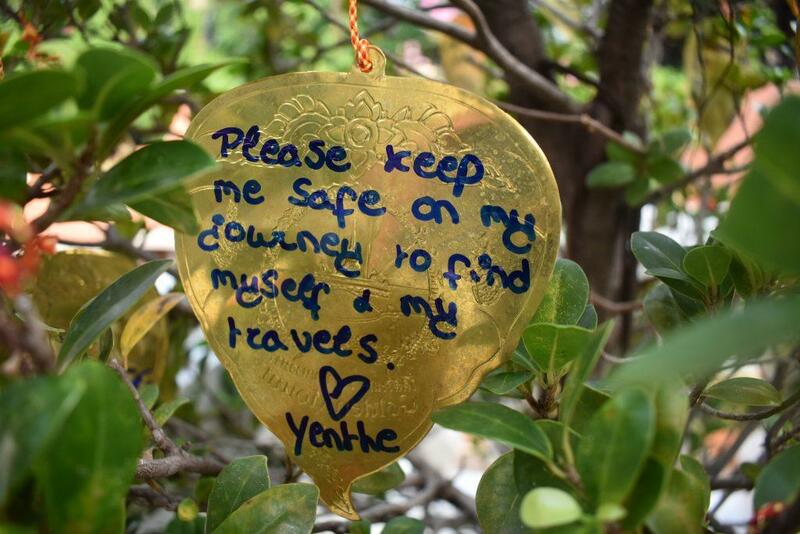 You can buy a leaf, write your message or wish and hang it from a bell at the top of the golden mount or from a tree at the bottom near the Buddhas footprint. 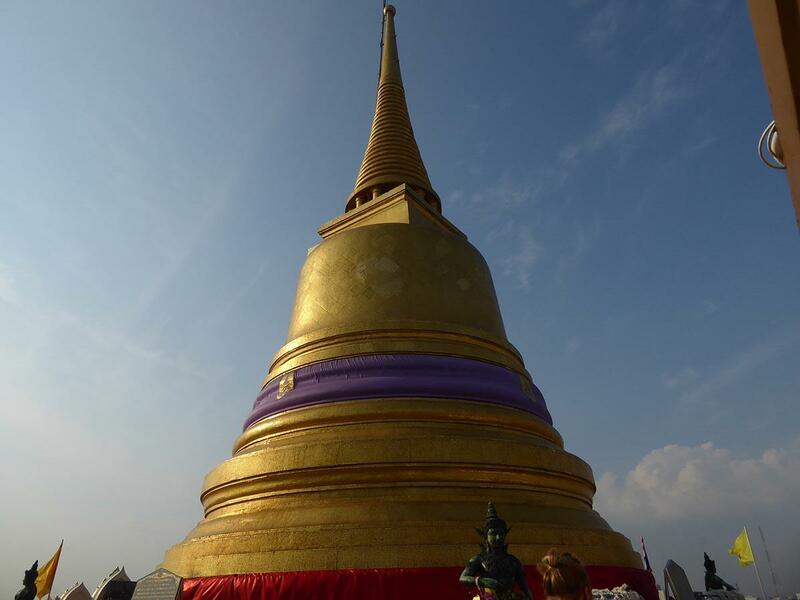 More relics of the Buddha is enshrined on the rooftop. 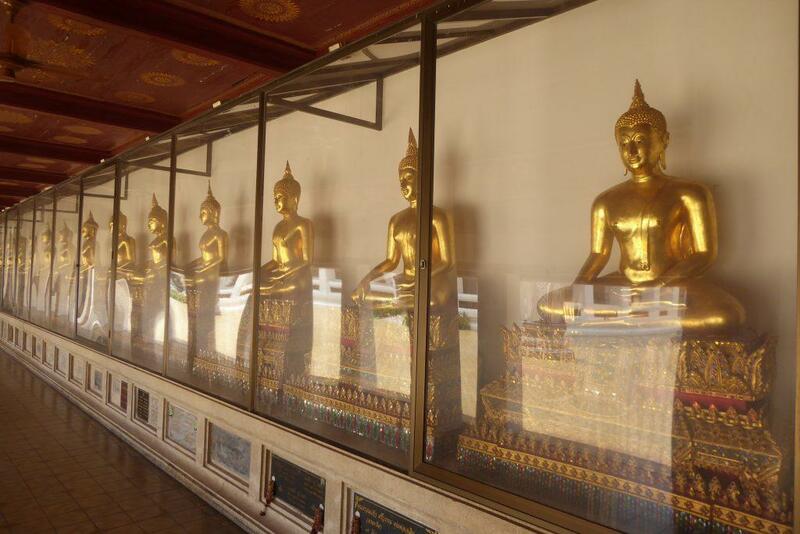 The Buddha’s relics were discovered in India by the British in 1896 & presented as a gift to King Rama V who donated some of the relics to Wat Saket where they were enshrined within the Golden Mountain. View from the rooftop. Wat Saket Temple below. The Temple of the Golden Mount itself also looks amazing when seen from a distance especially at night when it is all lit up. During the Loy Krathong festival every November there is a seven-day festival held at the temple which starts with an early morning procession up to the mount where a red cloth is wrapped around the chedi. 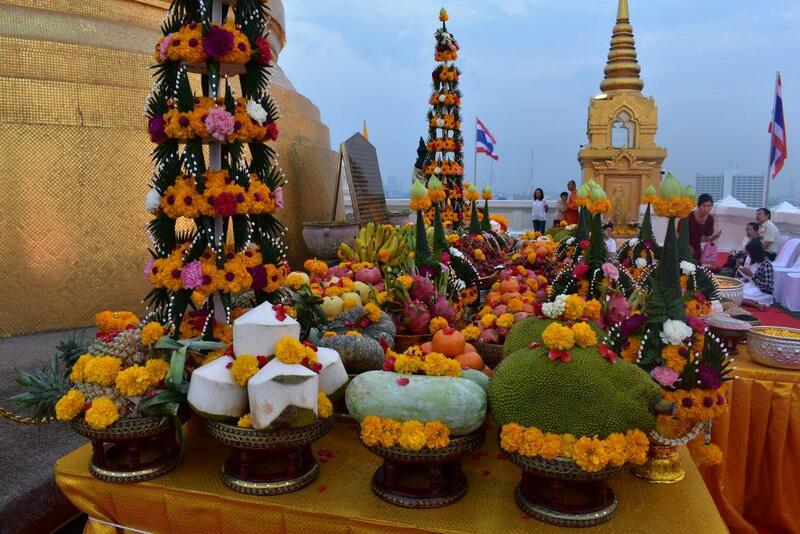 A blessing ceremony is held and there is a large display of fruit and flowers which are also blessed by the head monk. After the ceremony worshipers get to take the fruit & flowers. During this time the temple is usually open to visitors after dark. From the summit, you walk down a different flight of stairs to those coming up. You will come to a junction. 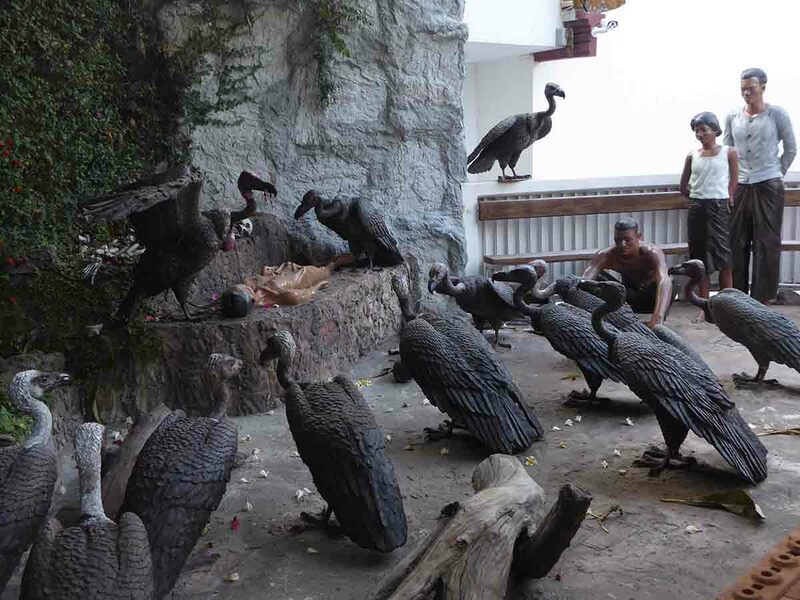 If you go right you will start to see statues of Vultures. During the reign of King Rama II, annual cholera epidemics broke out in the city, resulting in over 30,000 deaths over a period of years. The bodies could not be disposed of within the city walls and were taken to Wat Saket which was just outside the city gates. There were so many bodies that they could not all be cremated so many had to be dumped on open ground that became a food court for the vultures. Just above one of the mounts lower exits, you will find a small memorial to the dead with a recreation of the gory scenes. 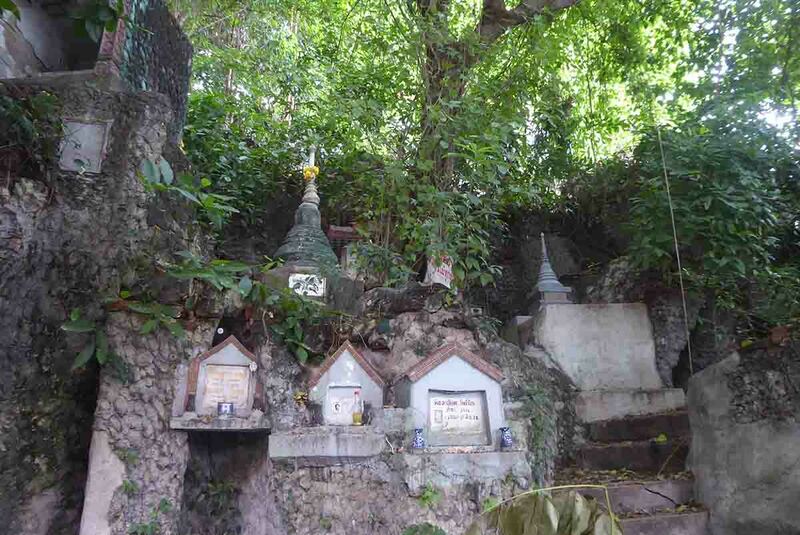 Below the vulture monument, you will come to a small shrine containing an image of a monk. 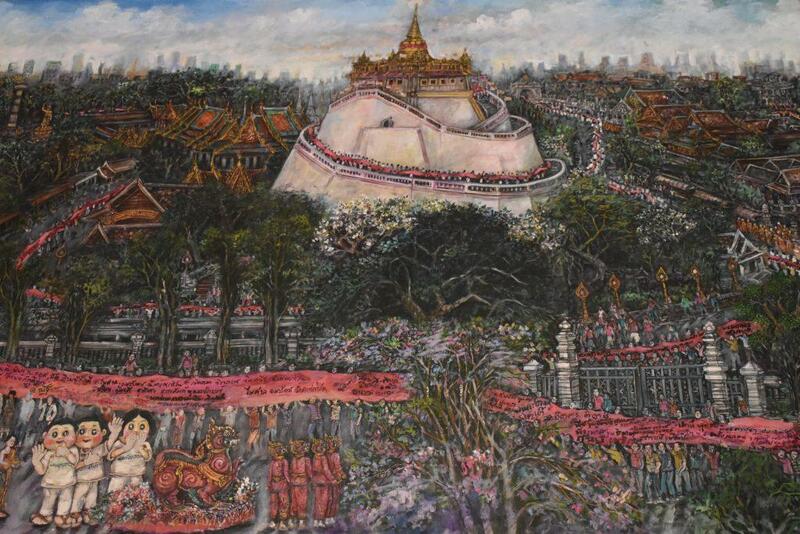 Below this is a court holding the image of Luang Por To. 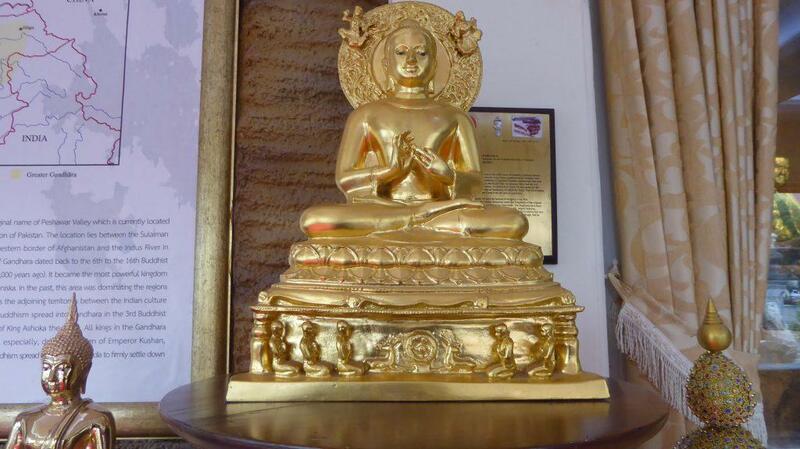 In front of the Buddha image is the Buddha’s footprint. 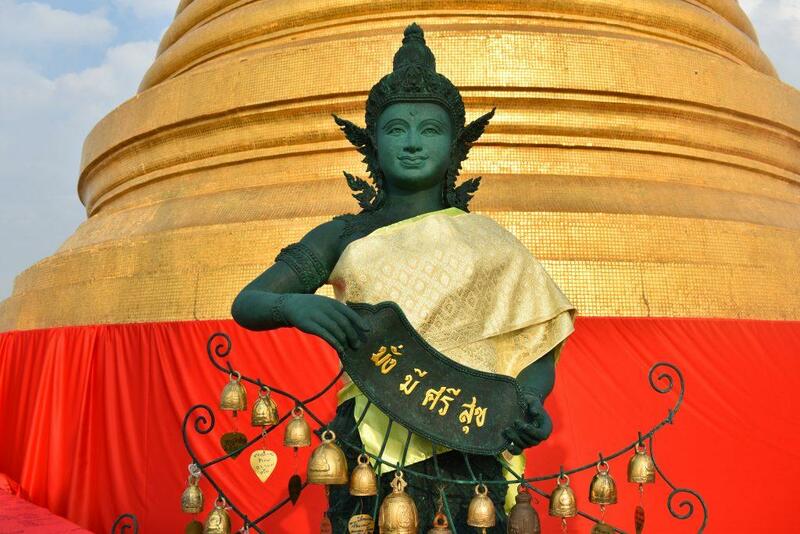 Luang Por To is a large, gilded Iron Buddha statue. 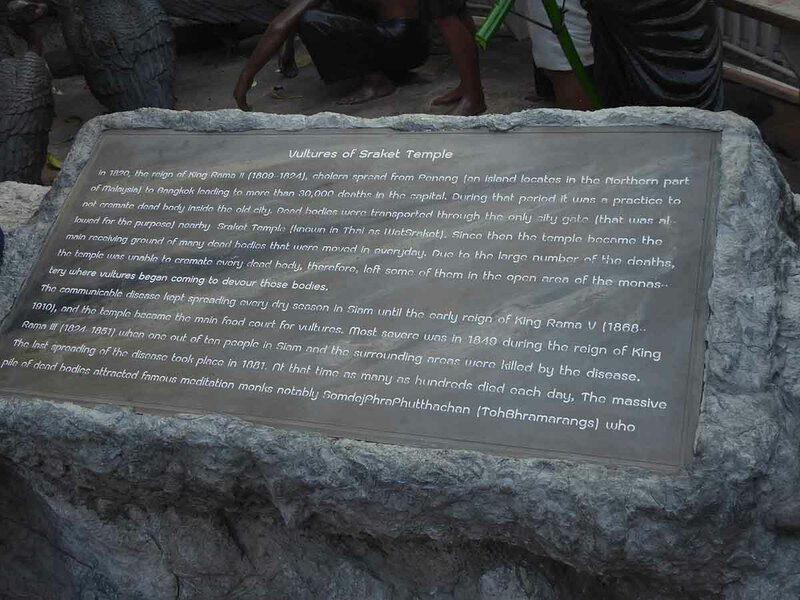 It dates from the reign of King Rama III. 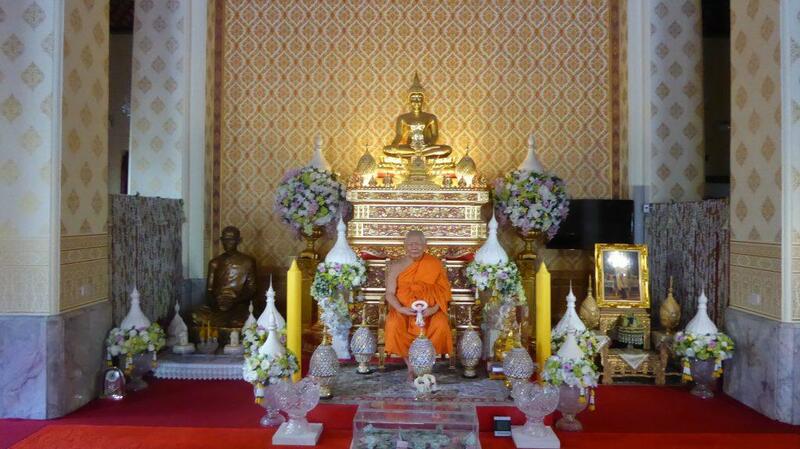 The Buddha is in a meditation posture. 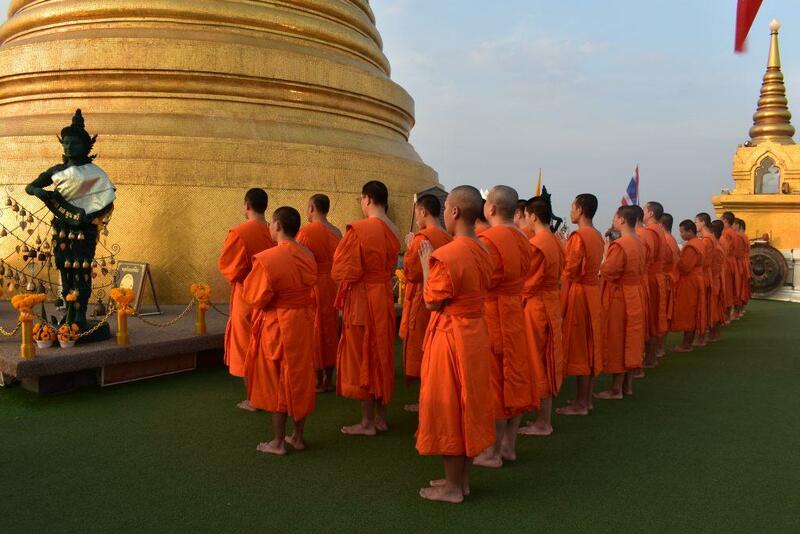 Worshippers come to pray at the statue as it is thought Luang Por prevents bad things from happening and provides happiness and joy to all. 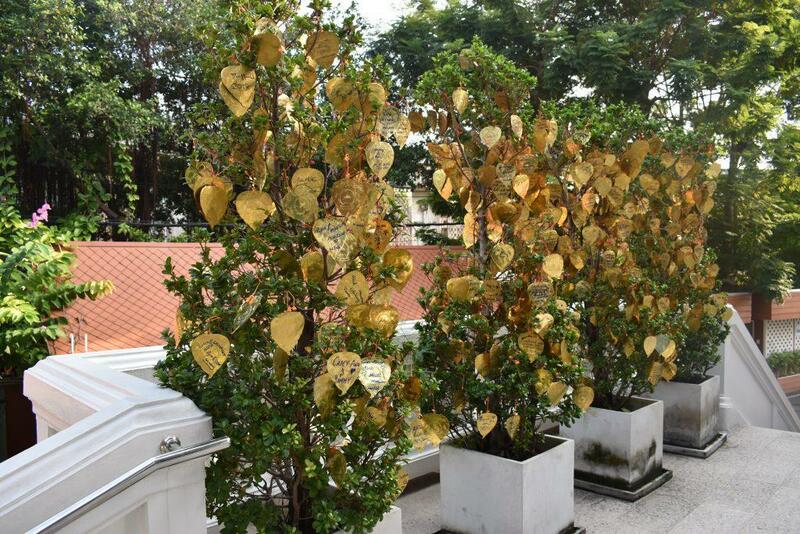 There is also a giant gong and some small trees with handwritten messages & wishes on golden heart-shaped leaves hanging from the branches. 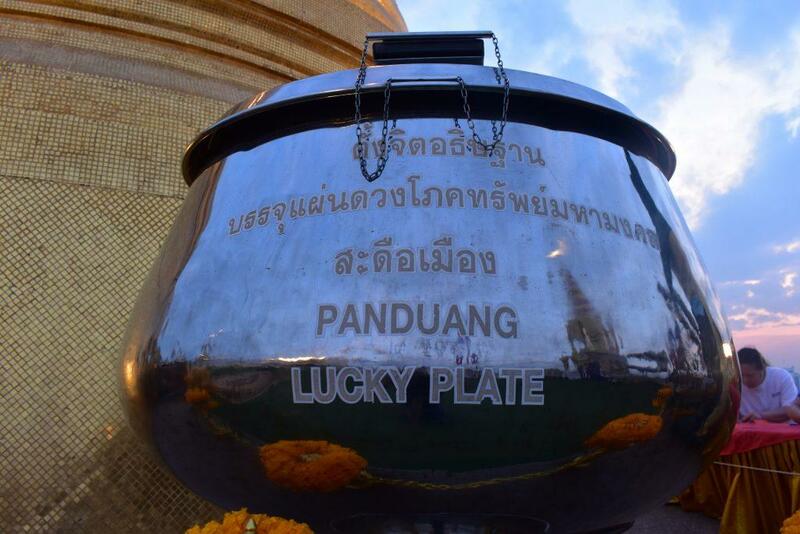 You can buy a leaf for 40 baht and leave your own wish or message. 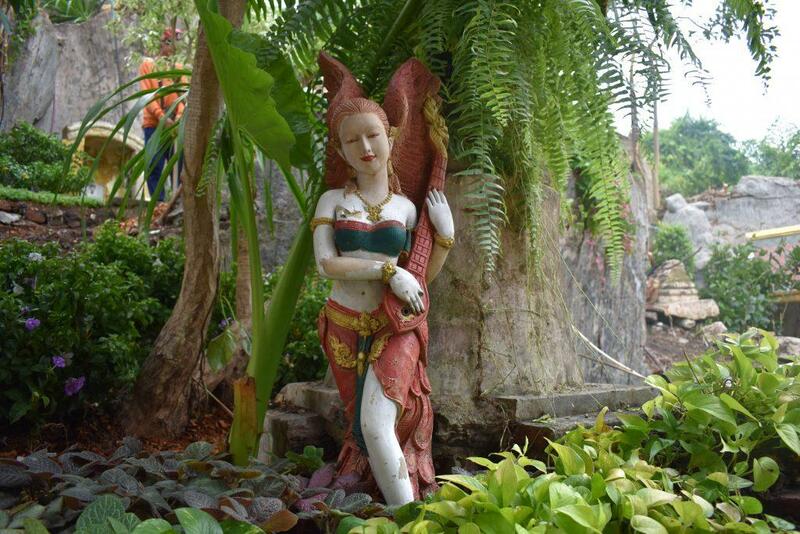 If you take the left turn at the junction you will pass a statue of Guan Yin and a model of the Golden Mount. Looking up towards the mount there are more statues and another shrine containing two Buddha images. 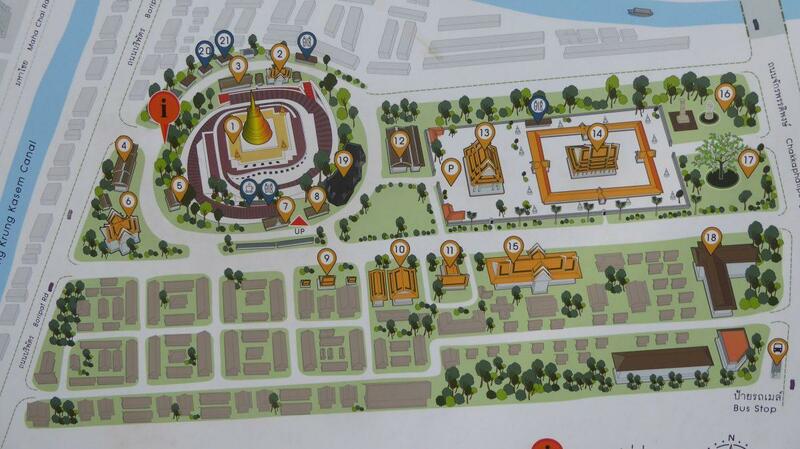 Wat Saket temple itself is at the base of the hill and is easily missed. 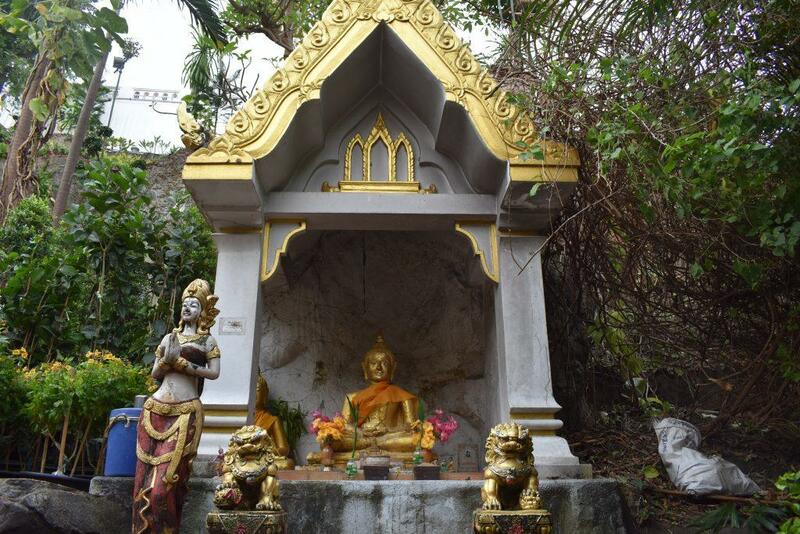 There are many Buddha images to be found in the temple complex and in buildings around the base of the mount. 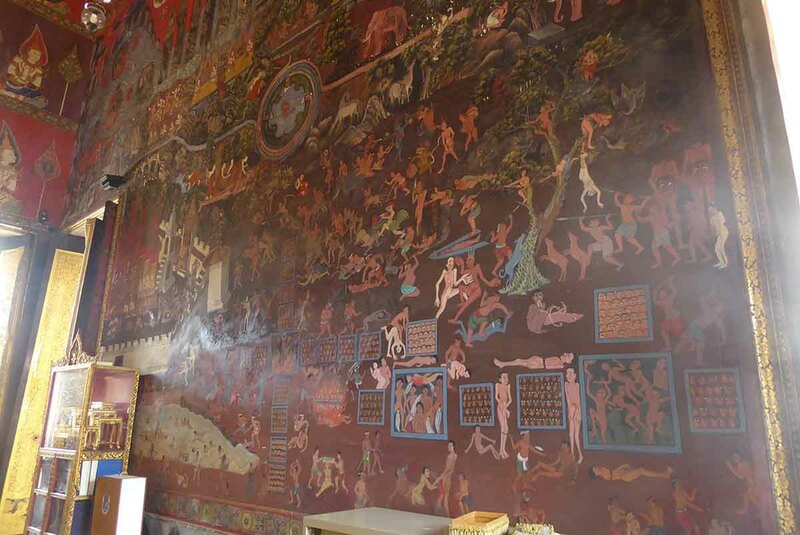 The Ordination Hall has a large seated Buddha image and some rare murals depicting Buddhist hell which are behind the Buddha image. A cloister lined with 163 Buddha images encloses the Ordination Hall. 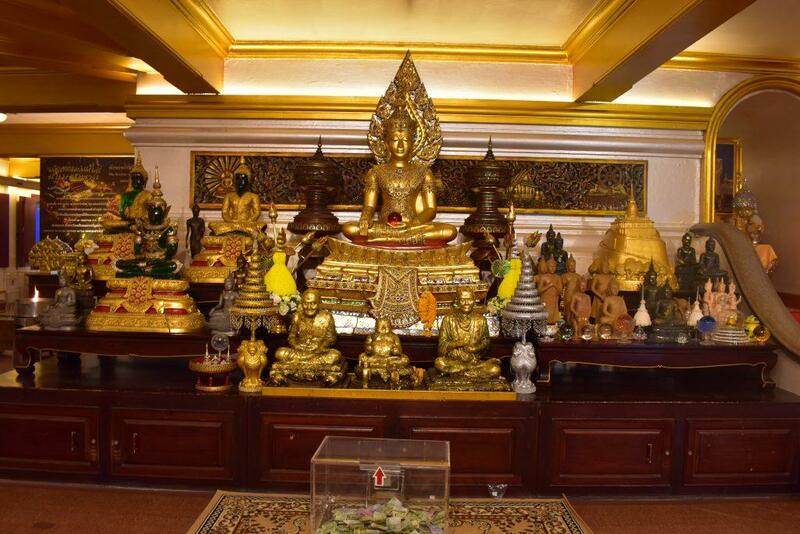 Next to the Ordination Hall is the Buddha Images Hall. 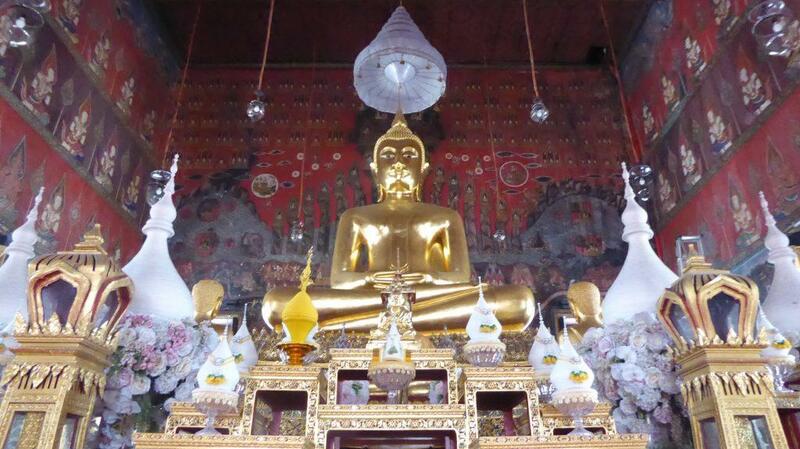 The hall contains a large seated Buddha, Phra Attharat Srisucot Thosopol Yanabophit and a large standing image, Phra Ruang. 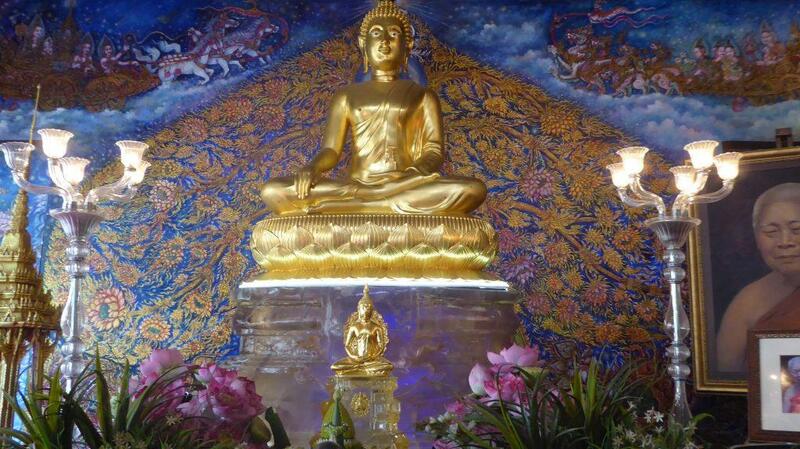 In the buildings around the base of the Golden Mountain, there are two lucky Buddha images. 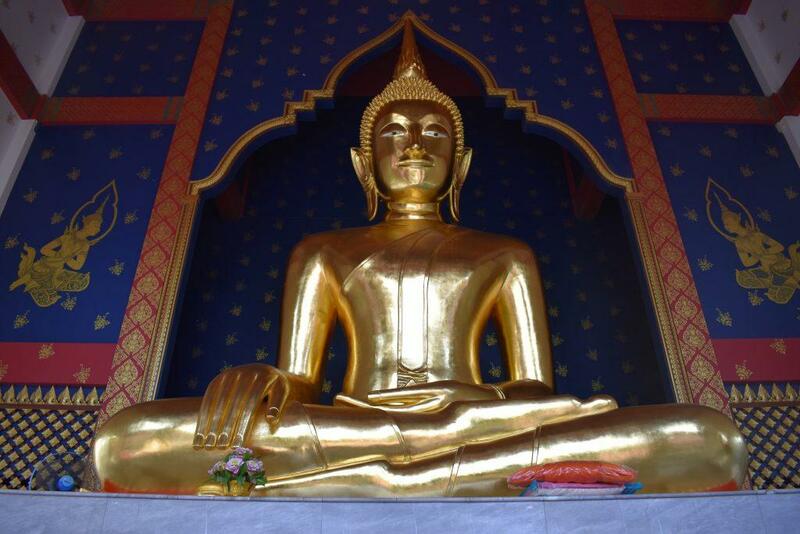 The “Lucky” Buddha & the “Fortune Buddha”. They are both seated, one is meditating while the other is sitting on a lotus base while pointing at mother earth. The lotus base brings good luck. 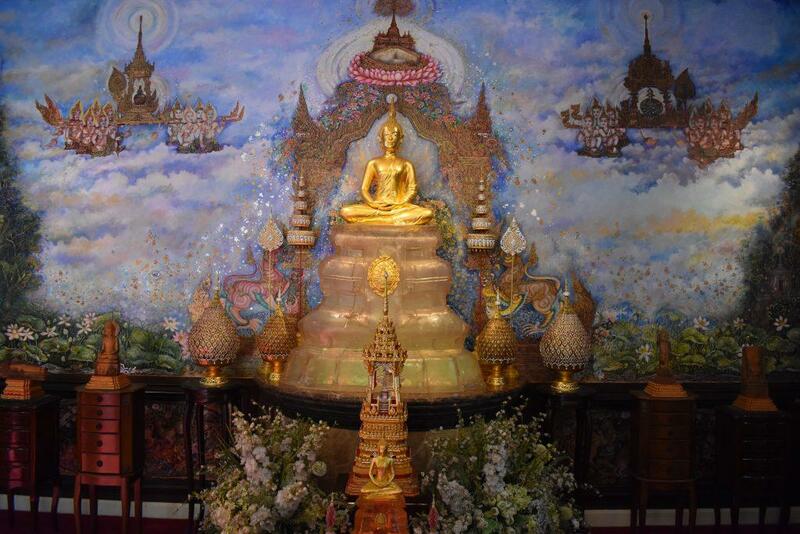 There are beautiful murals behind the Buddha’s in each building as well as more murals and paintings around the walls. 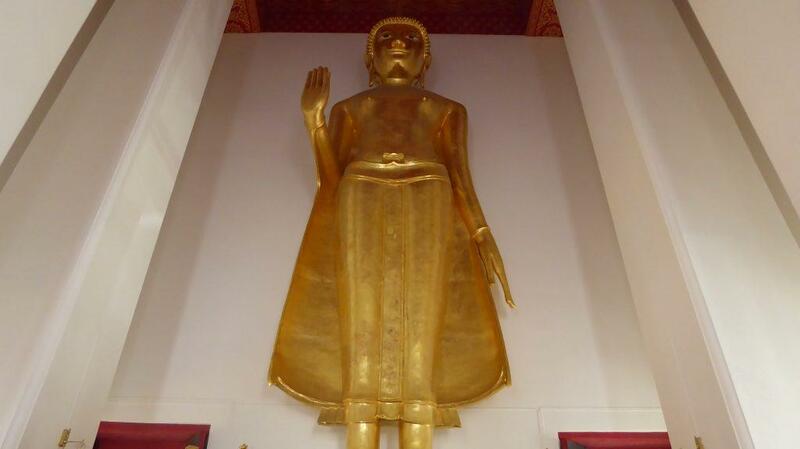 One of the most famous images at Wat Saket in Bangkok is Luang Phor Dam (The Black Buddha), an image in the posture of subduing Mara and dating back to the early Rattanakosin period. 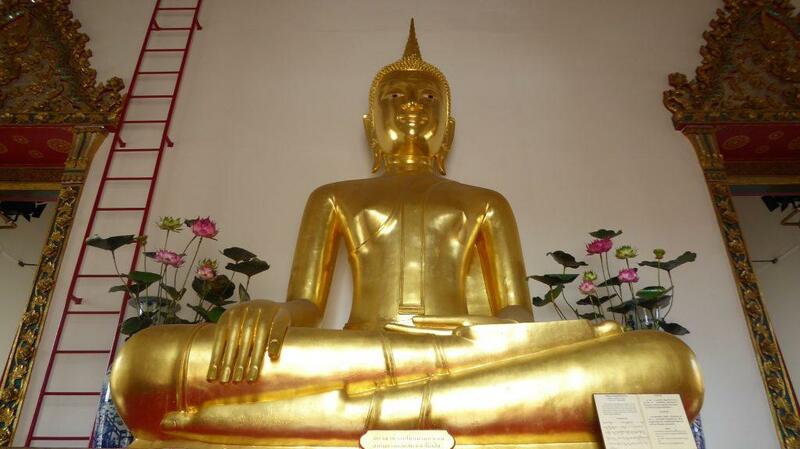 The Phra Dhamma Chedi Hall has an exhibition on Buddhism as well as more statues and artifacts. The Bamiyan Museum has fragments of Buddhist sutras from Bamiyan in Afghanistan. 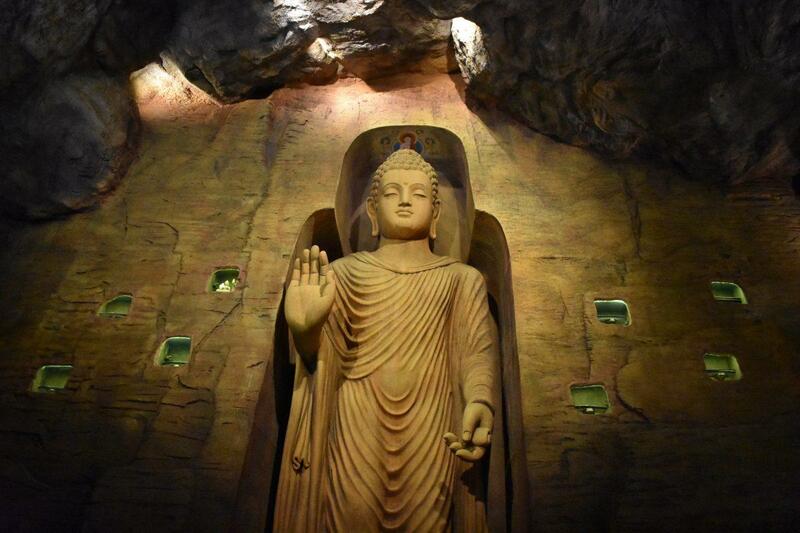 A new addition to the Bamiyan Museum is a cave in the base of the mountain containing a giant standing Buddha. 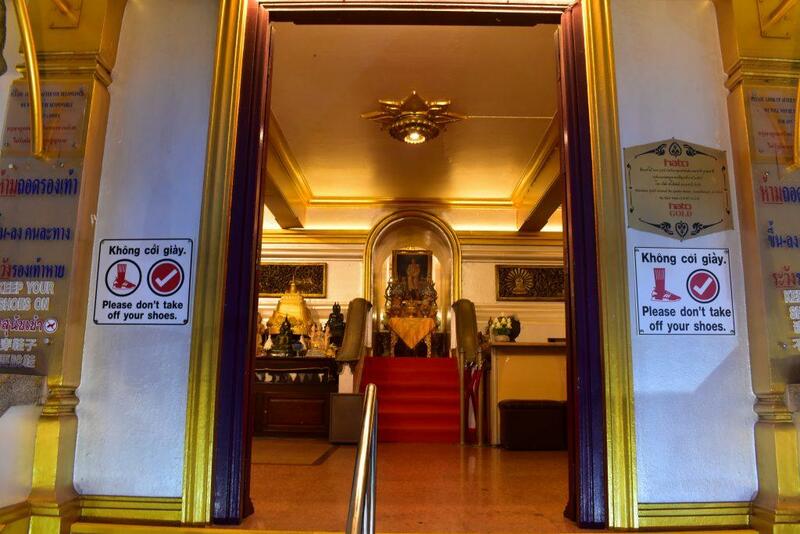 Other buildings include the Sermon Hall which contains another Buddha image with a monk in attendance to give blessings. Another interesting part of the mount is the cemetery at the base of the mount where many gravestones and memorials to the dead have been built into the base. 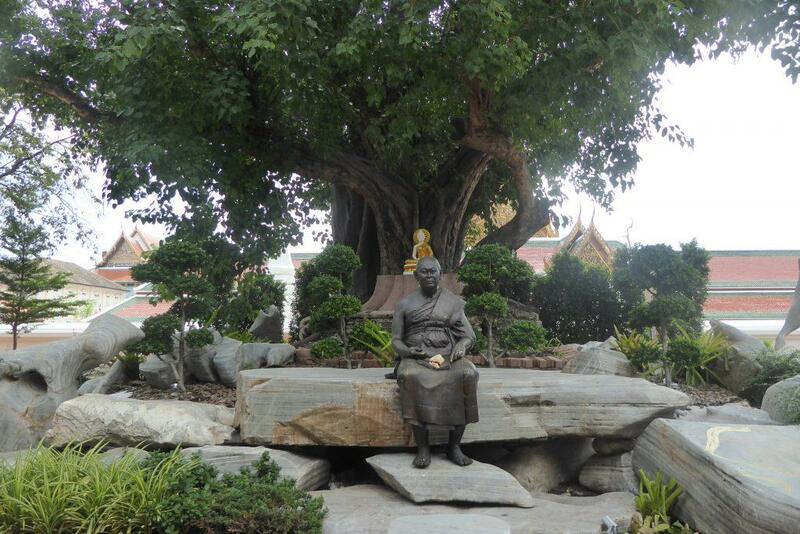 At the Chakkraphatdiphong Road end of the complex is a pleasant garden containing an old Lanka Bodhi tree and the pillar of Ashoka. 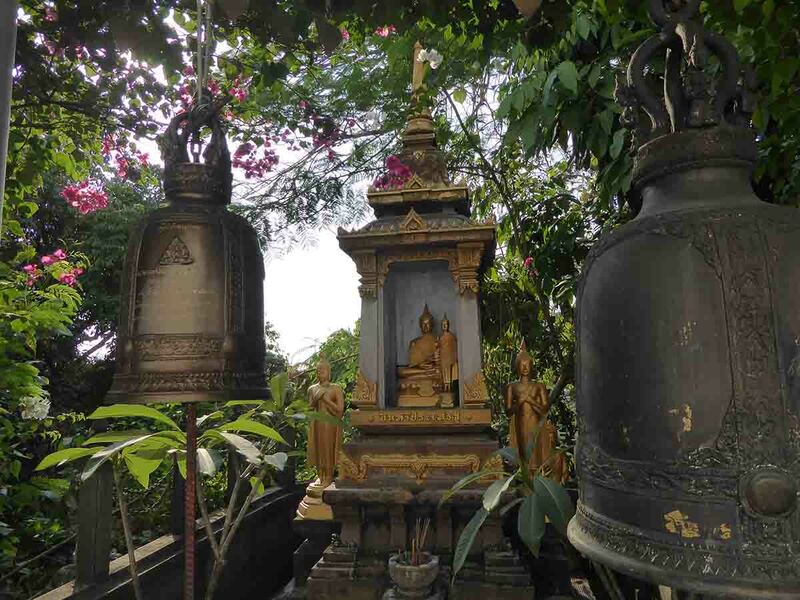 Wat Saket is an easy 10-minute walk from Khaosan Road and a few minutes walk from Tha Phan Fa Lilat Pier for the Khlong Saen Saep Express Boat. Many buses stop just around the corner on Ratchadamoen Klang Road or Mahachai Road. 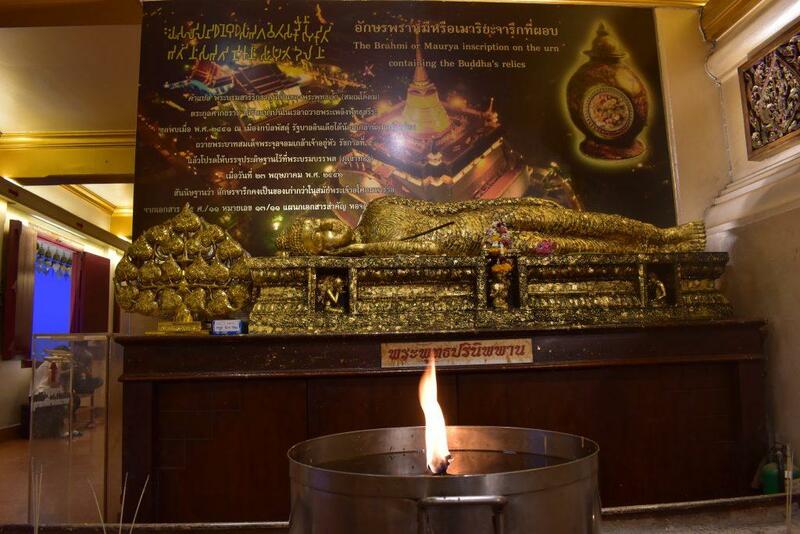 Wat Saket is one of the most well-known Bangkok temples and all taxi drivers know where it is. 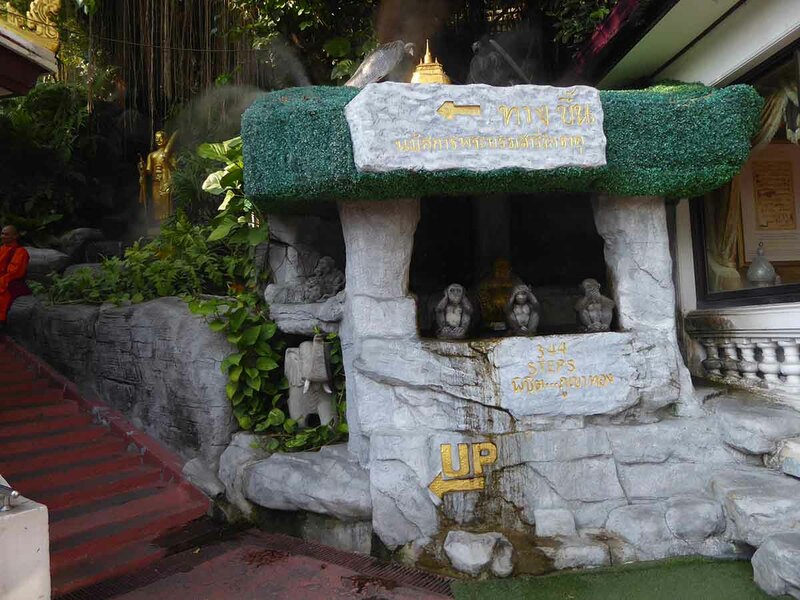 If you visit Wat Saket there are more interesting temples nearby. 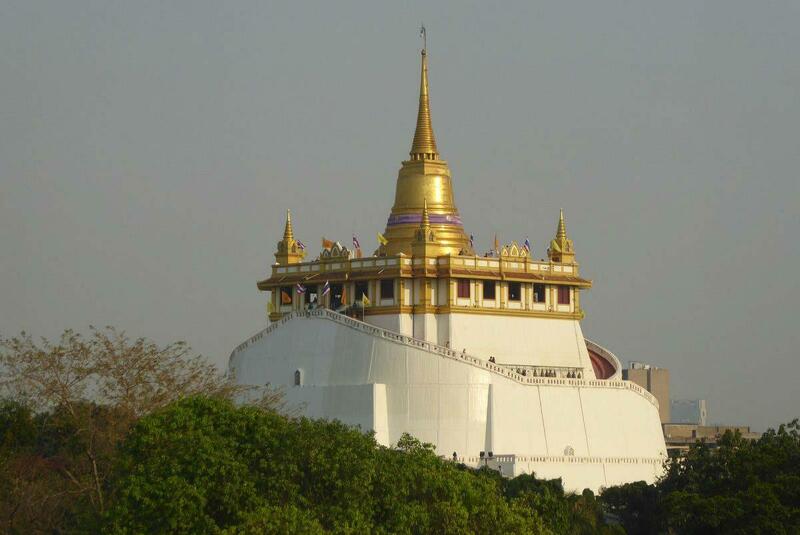 A short walk away is Loha Prasat and Wat Thepthidaram both of which are worth a visit. 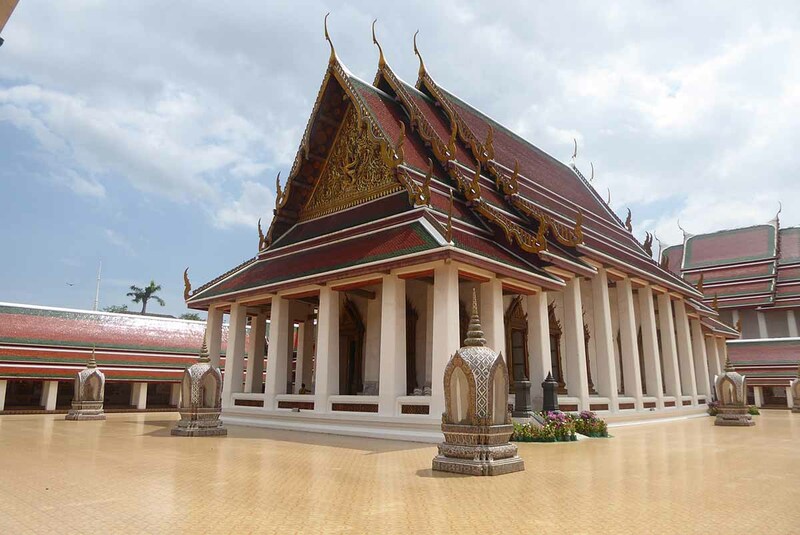 Also nearby is the King Prajadhipok Museum. Transport links are good with the Phan Fa Lilat Pier a few minutes walk away where the Saen Saep Canal Boat can whisk you to Ratchaprasong and Pratunam in 15 minutes. If you’re dying for a coffee or a bite to eat there is a pleasant cafe on the way up to the top of the Golden Mountain. Also nearby are Korrakang Cafe (opposite Wat Thepthidaram) and Blue Tree Coffee next to the 7-11 by the canal boat pier. There are a couple of street food stalls outside the 7-11. If you would like to stay in the area the budget price Smile Inn has nice rooms, hostel rooms and a nice terrace overlooking the canal. A few doors down is the Region Hotel. The RimKlong Hostel has dorm accommodation and a nice terrace by the canal. 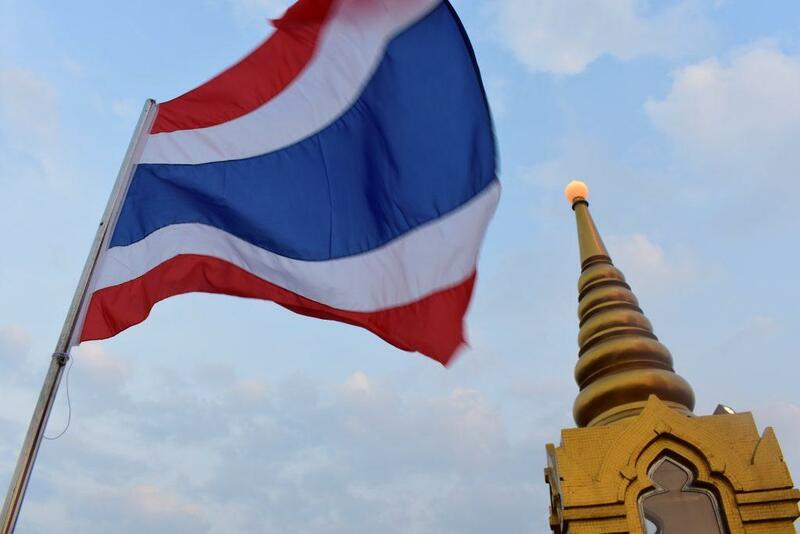 More accommodation can be found at Khaosan Road which is a 10-15 minute walk away. Location: 344 Paribatra Road, Ban Bat.